From Reno: Travel South on Hwy 395 to Gardnerville. From there, head West on Hwy 88. From Placerville: Travel South on Hwy 49 to Jackson; from there head East on Hwy 88 to Kirkwood. From the Peninsula: Take the San Mateo Bridge to 880 North. Head East on Hwy 580 to route 205 towards Tracy and merge onto Interstate 5 North. 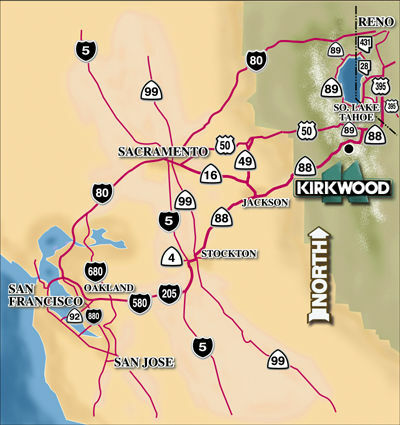 Go East on Route 4 to Hwy 99; go North on Hwy 99; exit on Hwy 88 and go East through Jackson to Kirkwood. The below map shows major routes but does not show the through-the-delta route on 160 to 12 East. Coming up 88 from Jackson, turn right into Kirkwood (there is only one entrance). Follow this road for ~1.2 miles. Meadowstone Lodge will be on your left (it has green shingle roof, grey-tan siding, flag poles on either side of concrete driveway down to the left). 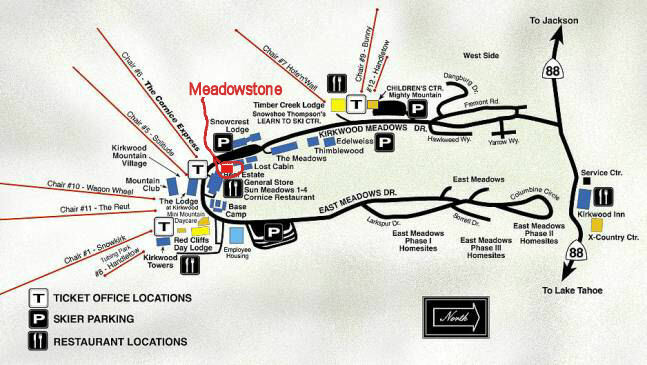 Note: Meadowstone is just after Lost Cabin and just across the street from SnowCrest; if you are by Sun Meadows or "Bubs" or The Lodge at Kirkwood, you have gone one building too far. Heatherstone's location is circled in red in the above map. Here is what the Heatherstone Condo looks like from the street. You go down the driveway down to the left of the building to the garage. The Condo has one parking space in the underground garage. If you're not the lucky one to park there, you can drive down into the garage to unload your vehicle, but then you'll have to park either in one of the few guest spots right in front of the condo building, or in the large parking lot a quarter mile further up the road. 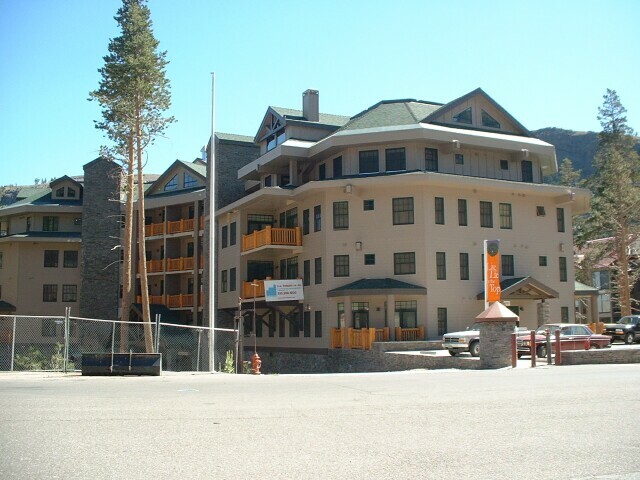 Guest parking spaces: are located in front of our building in a pad with 8 spots, and also on the street in front of the other (smaller) Meaddowstone building. You can use any free space but be sure to have a parking permit tag on your dash or else you'll get booted (we keep the tags on the kitchen counter - they hang on your mirror and have my #402 on them). Garage: turn left down into the downhill driveway and drive down into the garage. You can open the garage door by going through either door (your keys will open them) and pushing the open button. You can unload by parking next to the back (left) elevator lobby. Pull into parking spot # 122 around to the right corner (or, if it's Summer time and the garage is pretty empty you can feel okay about parking most anywheres).